This article describes the requirements, as well as the development of a small Mashup which makes use of the google maps and google earth API/plugin in order to display GPS tracks and photos with geotags (Picasaweb album)Â in your Internet browser. 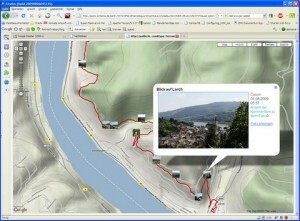 The service processes the parameters, launches the suitable Google Maps/Earth plug-in, fetches the Picasa photo-Layer as well as the GPS track and displays them in the specified maptype. You find an example here: http://public.binksma.de/earth.htm?kmlFile=Wispertal.kmz&user=pbinksma&albumID=5360264654852078769&type=osm (tip: click on the “Earth” button). index.htmlThis file works as a link generator. It is a HTML-form where you have to enter the kml-filename and a kmz-link to your picasaalbum. kmlFile: The name of the GPS track in kmz or kml format. The track itself must be callable via URL, in other words the file has to be uploaded somewhere. On my installation I place all kmz-files into a subfolder named “tracks” (see below). albumID: The number of your web album. You find it in the link of the RSS feed to your web album. earth – Google Earth in the browser. On the first use, the enduser has to install the earth-plugin. hybrid – Launching the Google Maps satellite picture view with labels, so street name and town name will be visible. The parameters listed above are optional. When they are not given, only the plain map will be displayed. Before you upload the files on your web server you have to do some little modifications. Parts which have to be changed are red. First some global variables are declared and parameters will be parsed from the URL. The init()-function will be called, directly after earth.html has been loaded. First the parameters of the URL are taken and links to the Picasawebalbum and the kmz-files will be generated. Important! Replace kmlUrl with the path to the directory where you will put your GPS tracks in future. 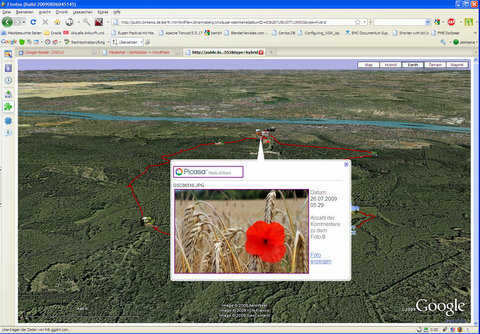 // obtain a pointer to the Google Earth instance attached to your map. earth.html is the page which is opened in your web brower. Again you have to modify a part of the file. This time you have to replaye my Google Maps API-Key with yours. The Key shown below works only if the page is called fom a URL starting with http://public.binksma.de. Otherwise you will get an error message from google. To get your own API-Key, you have to register at Google for free. With index.htm you can generate a link to earth.html in a quite simple way. After you have uploaded your geotagged pictures to Picasaweb albums and after you have uploaded the kml/kmz track, just enter the infos into the form and click on the “link generate” button. Again, you have to modify the index.htm. As you can see, the whole thing is quite rudimentary. Only one Picasaweb album and one GPS track can be displayed at the same time. There is virtually no error-handling. If something goes wrong with the URL-parametres, it will probably result in some ugly error messages. Neither it is planned to support other picture-hoster like flickr or zoomer nor will be support for other GPS-Dataformats like GPX. Your are warmly invited to implement your own improvements and to report about your work on this blog. Before you upload the files to your server you have to make the modifications decribed above, otherwise the whole thing will not work. Um, consider adding images or more spacing to your weblog entries to break up their chunky look. 1) Der hier eingangs zitierte (und schÃ¶n erklÃ¤rte) “earth.js”-File ist verwirrenderweise als “earth.htm” Ã¼berschrieben, genauso wie der dann folgende ‘echte’ “earth.htm”-File. 2) In dem schÃ¶nen Beispiellink oben ist ein Leerzeichen zwischen “…earth.htm?” und “kmlFile=Wispertal…”, wodurch ein Klick auf den BeispielLink nur eine leere Karte statt das Beispiel anzeigt. Aber das sind ja nur Kleinigkeiten – Ansonsten ist dieser â€œWebserviceâ€ schÃ¶n einfach und sehr nÃ¼tzlich. Kann man den Code so umbauen, dass statt der MiniBilder auf der Map nur einzelne (klickbare) Marker gezeigt werden? danke fÃ¼r den Hinweis und fÃ¼r die Blumen;) Ich habe beide Fehler korrigiert. Spontan hÃ¤tte ich gesagt, dass die Bilder Bestandteil der angezeigten KML-Datei ist. Man mÃ¼sste also Ã¼ber die Google Maps API das geladenen nachtrÃ¤glich modifizieren bzw. Teile der KML-Datei ausblenden. Was sagt denn die Referenz-Dokumentation von google hierzu?